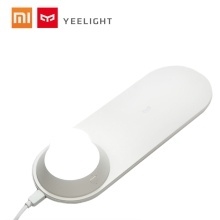 The Xiaomi Yeelight Wireless Charger with LED Night Light combines the night light with the mobile phone wireless fast charging, supports a variety of devices fast charging, overcharging protection and current and voltage regulation design ensuring charging safety. Removable magnetic night light can rely on magnetic adsorption on the surface of home appliances, its warm and warm yellow light, giving the night a warm guardian, 180 degree magnetic alignment, 3-4 hours of charging for warm yellow light continuously lighting up to 24 hours. Allows to charge for any wireless charging supported device with high sensitivity, intelligent identification. Removable magnetic night light, built-in battery, sucking on the the surface of home appliances, 2700k/5000k light color temperature. Overcharging protection and current and voltage regulation design ensuring charging safety.